This Multi Media TV Bed is definitely one of a kind. 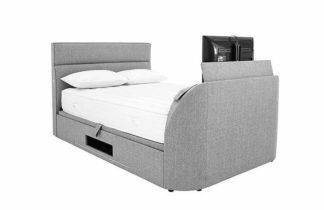 Its fantastic features and looks makes this one of the most advanced TV Beds on the market today. Finished in real leather for that extra stylish look. 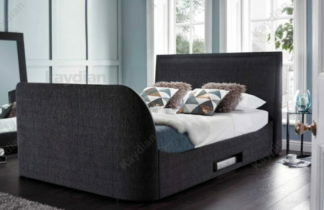 Made by Kaydian Design this Luxurious Multi Media TV Bed is definitely one of a kind. 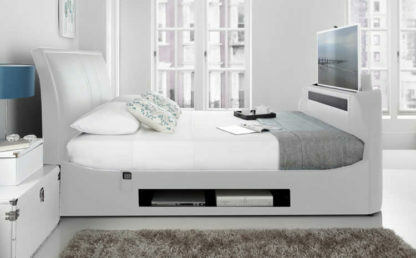 Its fantastic features and looks makes this is the most advanced TV Bed on the market to date. It’s 8 3d sound speakers housed in the foot end and the sub woofer work together to create the clearest surround sound effect from the comfort of your own bed. Finished in White Madras leather for that extra stylish look release stress, sit back and relax on the high padded headboard whilst watching TV in bed. There is no need for TV units as the TV is stored in the foot board and rises up with the push of a button. There is a compartment underneath the mattress area where you are able to store your DVD / SKY box or games console. 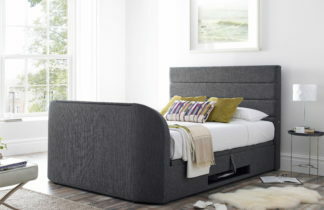 The bed frame base is sprung slatted to give that extra comfort and support.